I saw an outfit that Kate Bosworth wore to Coachella a couple years ago and instantly fell in love with the shape of the dress. I knew that I wanted to use her dress as an inspiration for a future dress for my little girl. My daughter is 8, almost 9 and she has developed her own wonderful sense of style so I wanted to be sure and create something that she would enjoy. We wanted something modern and slightly edgy but still very girly that used Tulip Tie Dye. We chose the colors teal and pink from our Tulip tie dye kit and began creating...we didn't want to go with a normal hippie tie dye style pattern so we tried to do a sort of modern twist on a plaid. My initial project was going to be for a baby boy one piece but I totally messed that one up, partially thanks to a terrible ear infection I've been dealing with...SO we thought back on this Kate dress and immediately knew we had to do it! 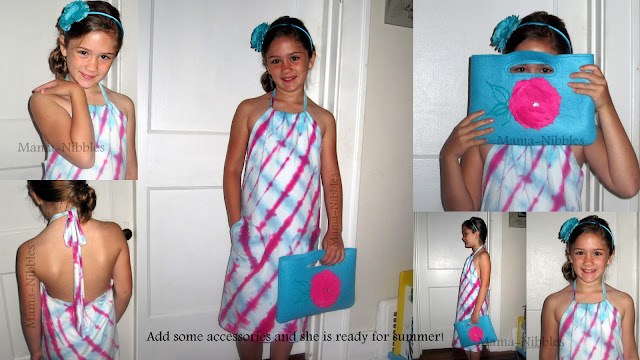 You can find out how to make your own cute dress in the steps below. NO sewing needed! 1. Use a dry shirt for more intense colors, use a damp shirt for more muted. Fold XLT mens tshirt up accordion style starting from the very corner and ending up at the top sleeve corner. 2. Roll this very long strip up, it should look like the middle picture. 4. Cover your work surface with plastic, Tulip makes a great surface cover that is large enough for most dining room tables. I taped mine down just to keep it from moving. 5. Choose the colors you will be dying with out of your kit. 6. 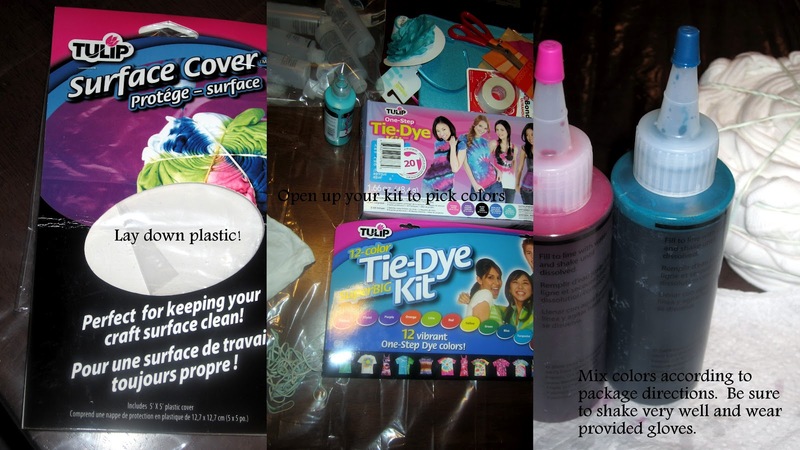 Mix the dye according to package directions. It's actually way simple to do, you just add in the packet of dye powder then add water to the fill line, cover and shake. Be sure to wear gloves at this point, the dye can stain your hands. 7. 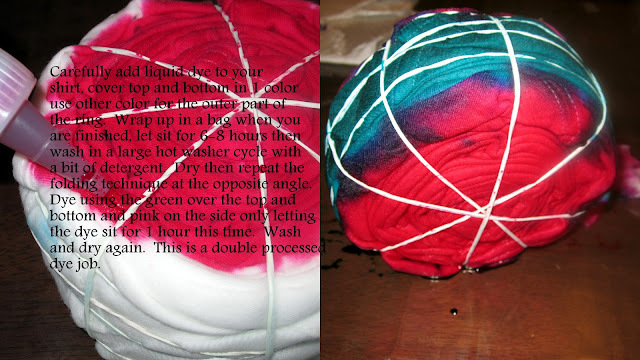 I did a double dye process to create my criss-cross plaid type look. I covered the top and bottom of my rolled up shirt in one color then did the outside edge in another. After sitting in a bag for 6-8 hours I washed and dried it then did the first steps up to this point again only reversing my colors. 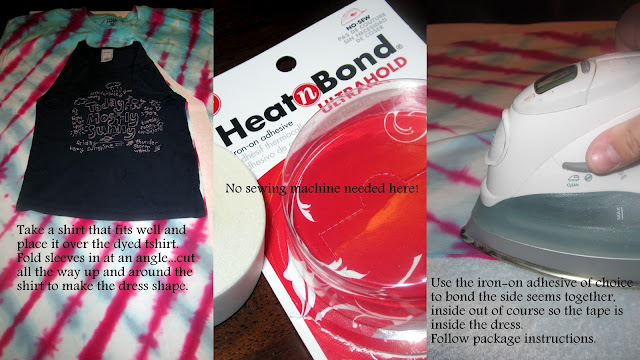 I let the second dying only rest on the fabric for about 1 hour before washing so it would be lighter. 8. 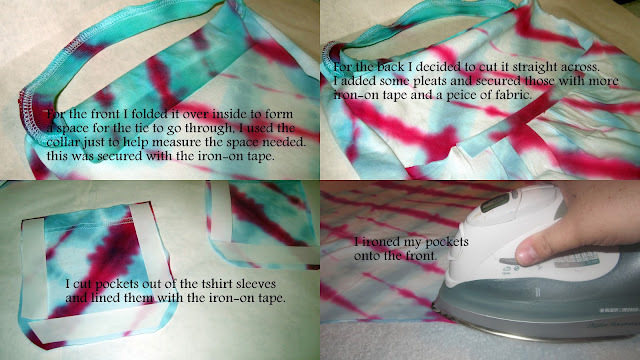 Take a shirt that fits well, place it over the dyed shirt near the collar and fold the sleeves inward on a diagonal. Cut from bottom to top to form the dress shape. Save the sleeves to cut pockets and save the sides to cut your tie from. To cut the neck tie be sure to start at the very bottom and cut all the way through the top shoulder for one long continuous strand. 9. Get out your iron-on adhesive tape. 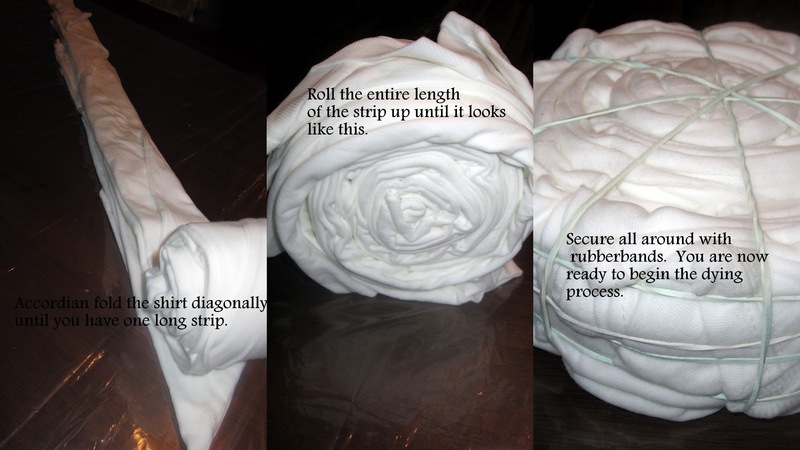 Flip dress to outside facing in, cut tape to go along the sides and iron it on according to package directions. This tape will last many washings! 10. For the front you will fold over about 2 inches and use a strip of adhesive tape to make a void space for the necktie to thread through. 11. You can do the same for the back OR I chose to cut it down for an open back. I created some pleating in the back and used a strip of tshirt with the tape to secure it. 12. If you wish to do pockets just cut out whatever size and shape you wish from the tee sleeves, use the tape to adhere those to the front. Now we are all finished! Add some cute accessories like the felt purse we made or a girly flower headband and you are all set, ready for summer! 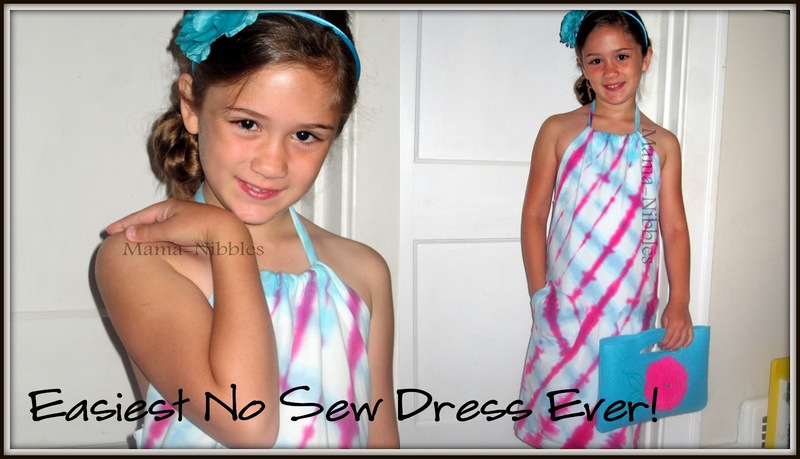 This project is very inexpensive and the dress would make a cute swimsuit cover up.